Halloween is over. You know what that means...2 months until Christmas! In retail world that translates in to Christmas decorations for sale, ads for deals on toys and other presents, and Christmas commercials galore. People tend to fall on two sides of this - either they LOVE all the early Christmas commercials or they hate them for their liturgical inaccuracy. As someone who really loved studying liturgical theology, I completely understand the concerns. BUT I also completely understand why people love the early Christmas music and commercials. And I think that, with the right mindset, you can find them less grating, too. I have had two babies, two pregnancies. As anyone who has ever been pregnant will tell you, the final stretch can see to last forever. Personally, once I hit that third trimester, I feel like I'm home free...even if I still have three months to go!!! But you can't help it - anticipating a baby is exciting. Maybe some mothers are more patient than I am, but I can't help but getting geared up for birth and meeting my new baby a good 2-3 months before that fact. In a way, that's my approach to Advent and Christmas. Mary was pregnant for a full nine months, and I'm willing to bet that when she reached the beginning of November, she was tackling whatever last minute things needed to be done. Swaddling blankets made? Check! That's my approach to November, and why I think the secular world isn't as off as one might think. We need this month before Advent begins, to complete our to-do lists. Christmas presents won't make/purchase themselves! We can take it a step further, though. As Advent begins, we can turn inward with full term Mary, and prepare our hearts and minds for the great feast of the Nativity. Yes, we may have a stray present to buy, but all in all, our disposition should shift in the way a woman's does as she approaches labor. With Mary, we can become quiet and focused, as we prepare to celebrate the birth of her son. But in the meantime, it's perfectly normal to be getting excited for what is coming. Christmas music reminds us to get done what needs to get done, because we are in the homestretch! If you take advantage of that, and allow joy to begin creeping in, you will be ready for the quiet anticipation of Advent. As with all things - turn what is of the world into something beautiful for God. This has always been my argument too! Mary sure as heck was thinking about "Christmas" in approximately "October" (so many scare quotes!) so I really don't stress about it. I try to take one holiday at a time, but the other day I just needed a little Christmas scented candle to get me through the day. ;) I take much bigger issue with people stopping the celebration on Dec 26th than I do with starting it on Nov 1st. What a great perspective! I was just chastising all of my siblings for their wildly liturgically inappropriate indulgence in general holiday merriment this past weekend. Maybe I should stop being such a grinch and do all my Christmas shopping now so that we can really have a "full term" advent this year. Love it Michelle. I hate early Christmas music because then I am SICK of it about a week before Christmas. I cannot enjoy finally singing Christmas carols at Mass because I have heard every stinkin' musician in the world do a version of Silent Night since the day after Halloween. I get what you're saying, but I still don't like it. Christmas shopping now so you can enjoy Advent - get it. Hanging up lights now before it's too freezing cold - get it. My grocery store playing "I Want a Hippopotamus for Christmas" yesterday - totally annoyed. I am so with Bonnie. I definitely get the Mary thing (wow that sounds bad...) but I cannot listen to Christmas music for that long. There is a big difference between prepping and celebrating is also why I don't do Christmas things in Advent. Advent is a season of preparation not celebration. 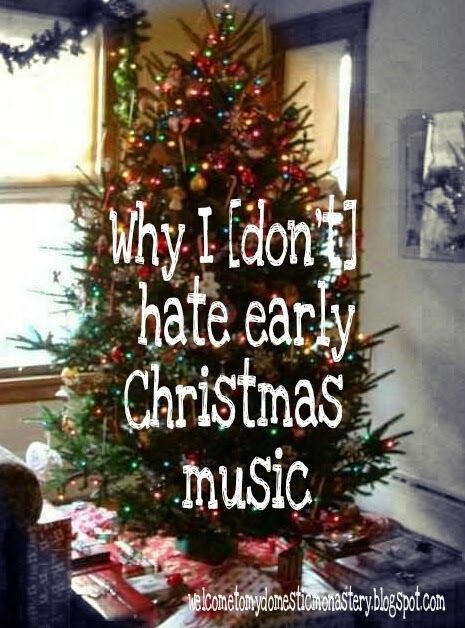 But really my main reason is that we celebrate Christmas until the traditional end- February 2nd and there is no way I could take music for that long!!! What a wonderful perspective! Thank you for sharing it.